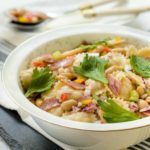 A recipe for White Bean Salami Pasta Salad made with white kidney beans (cannellini beans), salami, onion, bell peppers, and an oil and vinegar dressing. Cook the pasta according to package instructions. Drain, rinse with cold water, and drain again. While the pasta is cooking, place all remaining ingredients except celery leaves in a large bowl. Chill for 6 hours or overnight. Garnish with celery leaves before serving if desired. *If you substitute the oil, be sure to use one that will not solidify when chilled.